Silk-Filled Bedding Sale - Continental Queen Size. Top Quality Long-Strand Mulberry Silk, Luxury Hand-Finishing - Superb! Below you have a choice of 10 different luxury long-strand mulberry silk-filled bedding sets - duvets, mattress toppers and pillows - all for the continental queen size bed. The bedding interiors contain 100% pure, natural and hypoallergenic top quality long-strand mulberry silk. No chemicals or any other kind of treatments or processing are used. Luxury silk bedding at its very best. Significant savings are made when purchasing any of these luxury silk bedding sets compared to buying the same items individually, even at our already fantastically low sale prices. All Silk Bedding Direct bedding is OEKO-TEX® Standard 100 Certified and are complete with the OEKO® "Confidence in Textiles" quality assurance labels. All orders are covered by a 14 days full money-back guarantee. Return for any reason, we'll even pay the return delivery fee. We're sure you'll love your long-strand mulberry silk-filled bedding! The wonderfully soft mulberry silk interiors can be seen and felt via inspection zips on all our products. Luxury quality mulberry silk-filled bedding is our specialism, we promise you won't be disappointed. These are the very best of the best of mulberry silk-filled bedding. Note: “Combination Silk-Filled Duvets” are All Season Duvets - a Summer and a Spring/Autumn duvet that can be clipped together to make a super snug and warm Winter duvet. 3 duvet thicknesses for the price of 2! Click below for full details. "Thank you so much my silk bedding arrived yesterday. Loved the packaging. The pillows, duvet everything felt so soft and lovely to touch. You have been so nice to deal with, will certainly be recommending your products to friends and family." 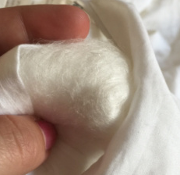 "I had never heard of duvets filled with silk before, a friend recommended them and I am so grateful she did, really wonderful. Even my husband noticed the difference, and that's saying something!" "You people are right, your silk filled duvet is the best bedding I've slept in, never will change back." "My son has asthma so I ordered one of your duvets, now it's arrived I'm ordering a double for our bed too! You can use my comments to tell others, I can't recommend your duvets highly enough, so soft, light and natural too." "I just want to let you know how pleased I am with my silk duvet, it's so so warm and comfortable yet so light, thank you."